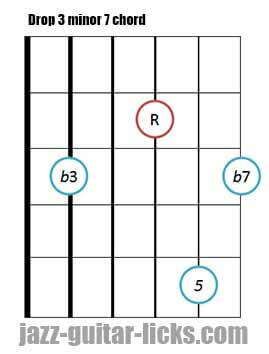 What are minor seventh chords ? There are many ways of writing the same chord. It is often very confused for a jazz student to become familiar with all the nomenclature for writing chords. The main symbols for minor seventh chords (example in C) are Cm7, C-7, Cmin7, Cmi7. 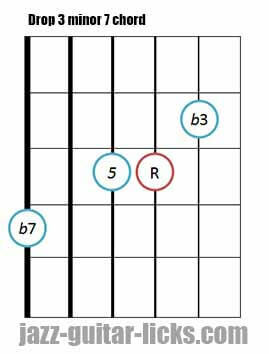 Drop 2 chords are are built by dropping the second highest note of a four-notes close voicing to the bass. 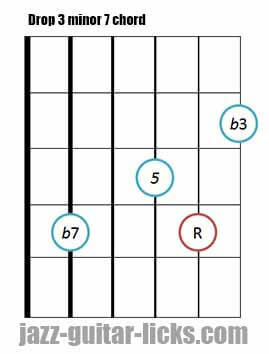 Minor seventh close chord formula is 1-b3-5-b7 giving the following drop 2 chord formula 5-1-b3-b7. 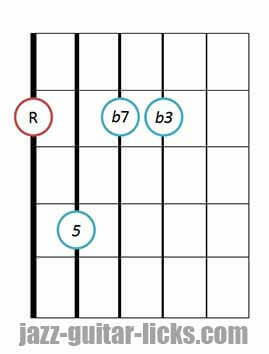 Drop 2 voicings are very important devices used for jazz chord arrangements. It means that the notes of the chord are inverted. The root of an inverted chord is not in the bass. 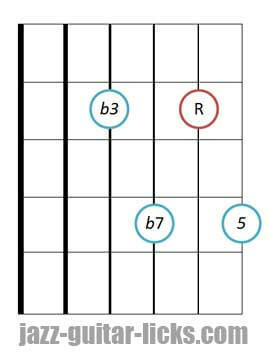 As you can see in the guitar diagrams above, there can be a minor third, a fifth or a minor seventh in the bass. 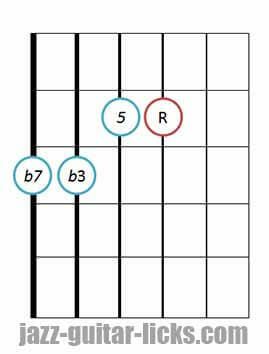 Here are four drop 2 minor seventh chord voicings (The therm "voicings" is the order of notes in a chord), including three inversions. 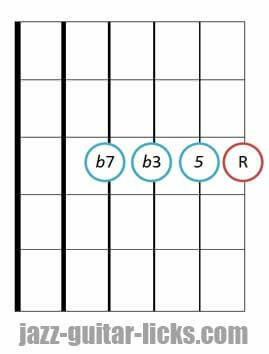 These three illustrations show you how to play the four drop 2 voicings on guitar with the lowest notes on the fourth, fifth or sixth string. Each position is represented by a specific color. The root voicing is marked in black, the first inversion is in blues, the second in red and the third is in green. 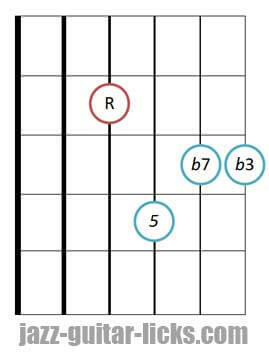 Here are four drop 3 minor seventh voicings with guitar diagrams. If you want to learn more about drop 3 voicings, please check out this blog lesson. 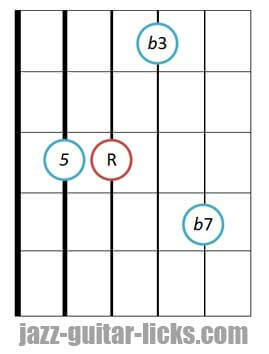 These two guitar neck diagrams show the relationships between the four drop 3 voicings previously seen in the formula chart above. 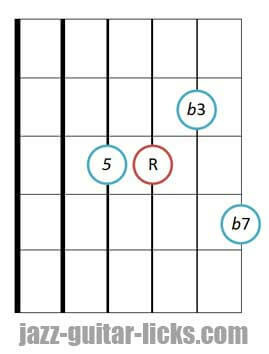 The first has chords with the lowest note on the fifth string, whereas the second has the lowest note on the sixth string. Also, you can see that each voicing is marked with a different color. Black for the root position, blues for the first inversion, red for the second and green for the third. Drop 2 and 4 voicings are not the most used in jazz music, but can be very useful when you want to create new sonorities. They also provide an effective way to learn your guitar freatboard. 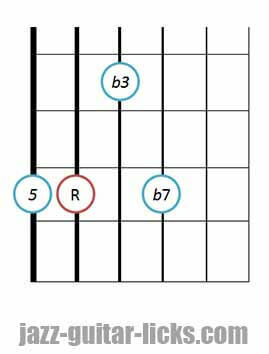 Drop 2-4 chords can be used in place or to complement drop 2 and drop 3 chords in solo or duo, when you need to accompany a singer or a soloist. You can see that the first inversion has the minor third (b3) in the bass, the second inverted voicing has the fifth in the bass (5) and the third inversion has the minor seventh in the bass. 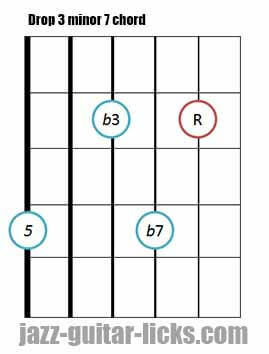 The two shapes below show how to play minor 7 drop 2 and 4 voicings on guitar. The root position is in black, the first inversion is in blue, the second in red and the third in green. 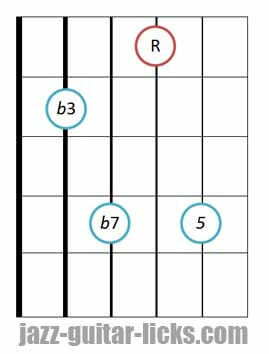 The chords in the first shape have there basses on sixth string whereas the chords in the second diagram have basses on the fifth string. 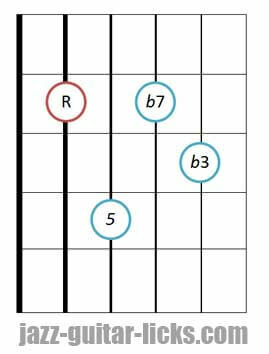 Please notice that drop 2 & 4 voicings occur a string skip between the second and third highest note. This is the particularity of Drop 2-4 voicings. 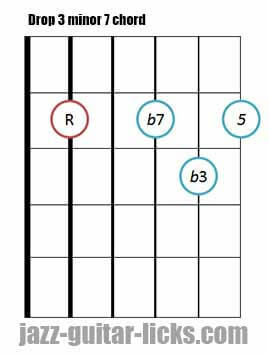 Here are the minor scales related to the minor seventh chords. 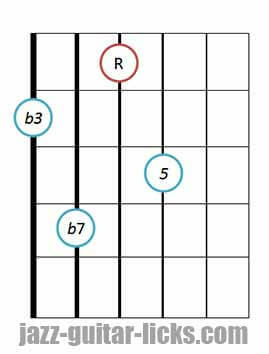 By stacking the root, the minor third, the perfect fifth and the minor seventh of each minor mode below we obtain a minor seventh chord. 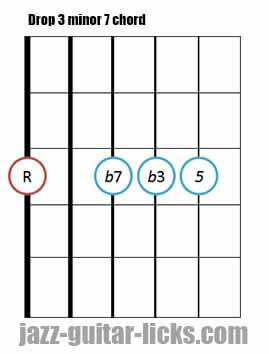 It means that you can improvise over any m7 chord using these following scales. 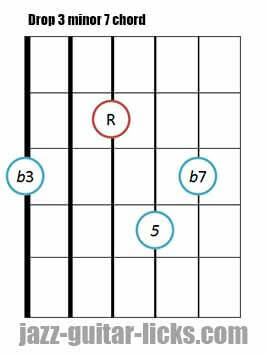 This is the second mode of the major scale. 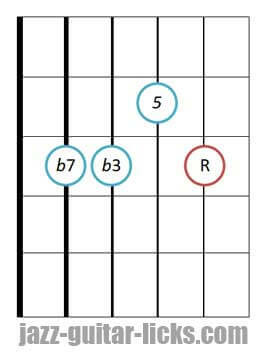 Sixth mode of the major scale (natural minor scale). The second mode of the melodic minor scale. 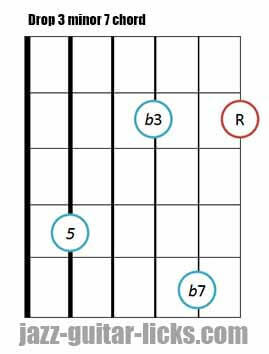 Compared to the dorian mode this scale has an additional note, a major third, between the minor third (b3) and the fourth.